This infographic landed in my facebook timeline and I couldn’t help but share it everywhere possible. It goes without saying, if you can’t love yourself, who can you love? 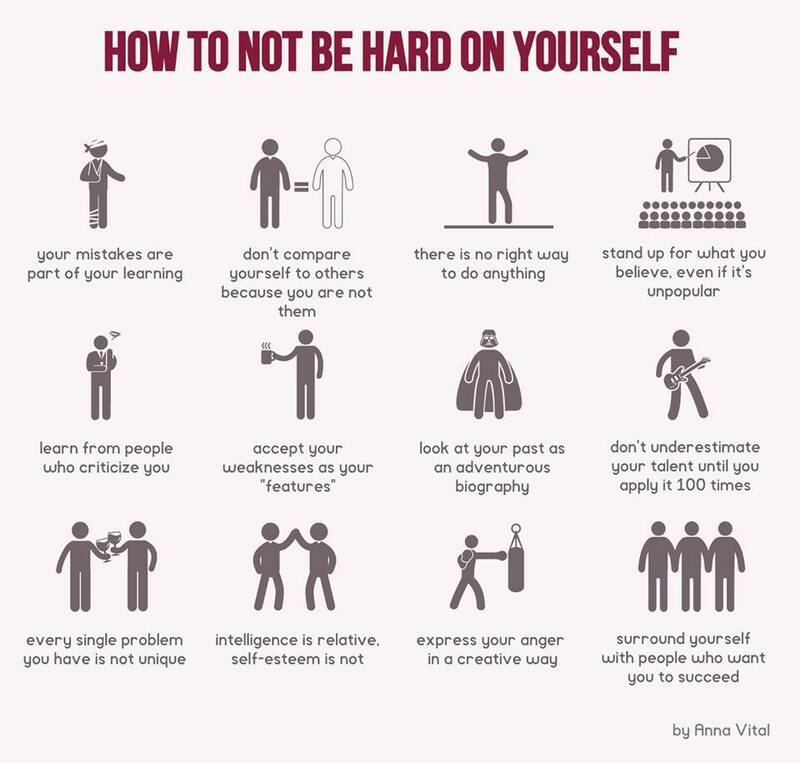 I’ve heard so many confessions over the past week; absolutely wonderful, hard working, high achieving individuals who have a difficult time accepting themselves as they are, and who make daily habits of being hard on themselves to the point of depression. Maybe it is an indicator of how our society measures “success”, and that hunger to succeed that drives us to self-loathing. At some point it should dawn on us that it is our personal responsibility to learn to be kind to ourselves first. We owe it to ourselves to learn to love ourselves- truly love ourselves, accepting our “flaws” and our strengths. It is only in so doing that we can ever truly love another. And I should know. I’ve been there too. I hope you enjoy this infographic as much as I did. Make a mental note on what you can do, what you already do and things you really want to start doing, like, right now. I promise you, you will feel better! Ah, I’m so glad to have found this here. Keep things relative—it is unfair to decontextualize your problems, and to isolate or dehumanize yourself. You exist in a big world full of other people, and you are never alone in your feelings (even if everyone else feels far away). I’m glad you enjoyed it as much as I did! And yes! So many people feel so isolated even in a world where we are constantly connected- it’s bizarre! Learning to pull ourselves out of the situation and be objective, and more importantly to be kind to ourselves is a survival tactic we must all learn so that we can continue to grow and thrive! Thanks for the re-blog!